There is nothing like adding character to your outfit. At Sash Jewelry Repair we offer fine jewelry that gives you the perfect balance between modern and vintage. We guarantee that with the variety of fine and custom jewelry designs we carry, you will find what you are looking for. One way to be sure you have an original piece is to have a jewelry designer make an original piece just for you. Let us design the engagement ring of your dreams. People wear jewelry to make a statement; the pieces they wear usually reflect their style and personality. Jewelry using specific precious stones can be a great way to express you; many people use birthstones for this purpose. We pride ourselves in providing top quality jewelry at affordable prices. Jewelry is our passion, and we guarantee you will love our selection. As a result of our excellent customer service and remarkable jewels, we are the favored jewelry store in Manhattan, NY. Stop by Sash Jewelry Repair today and see our collection for yourself. If you are looking for a stunning bridal ring, precious stones or a jewlery designer, call Sash Jewelry Repair in Manhattan, NY today! When you visit our jeweler, you will be treated with the breathtaking sight of our splendid collection of fine jewelry. We are a premier shop that is known for our warm, friendly service and extensive product selection, which includes a lineup of diamonds and fine jewelry. As a premier jeweler, our brand of customer service goes beyond recognizing your faces or knowing you by name. Our service is not be complete without knowing your personal tastes and preferences too. We see to it that you are always welcome and comfortable in our shop. If you are trying to find a gift for that special someone, and can’t find anything that quite fits them, Sash Jewelry Repair offers a unique and personalized designer to help you with custom jewelry. Create a piece that comes straight from the heart. We go out of our way to know our customers better. Building a good relationship with every client has kept Sash Jewelry Repair thriving. We have made a name for ourselves because of our excellent service. If you want to learn more about our jewelry store or in need of jewelry repair, please visit us today in Manhattan, NY! Looking for the perfect diamond engagement ring for the love of your life? Then Sash Jewelry Repair is the right place for you. Not only do we have a wide selection of fine jewelry, but we also create stunning custom made jewelry. We understand that picking the right engagement ring is a weighty task, so let us help you through the process. Our jewelry store can point you in the right direction and assist you while looking through all of our bridal rings and diamonds. If you still cannot seem to find “the one” then we can look into having a jewelry designer make you your very own custom jewelry. There’s almost nothing we can’t do for our customers. No matter how much you cherish or care for your favorite necklace and rings, jewelry has a way of getting old. If one of your favorite pieced needs repair Sash Jewelry Repair offer a jewelry repair service. Fortunately, we can fix the broken clasp on your grandmother’s pearls or replace the diamonds on your favorite bracelet. Our jewelry repair service can fix almost anything. We can straighten bent gold, polish precious stones and much more. Fine and Special Occasion Jewelry are particularly important to keep in good condition. If your gold jewelry needs a repair then stop by our store for jewelry repair service. Bring all of your broken jewelry and watches by and we will make them look like new again. 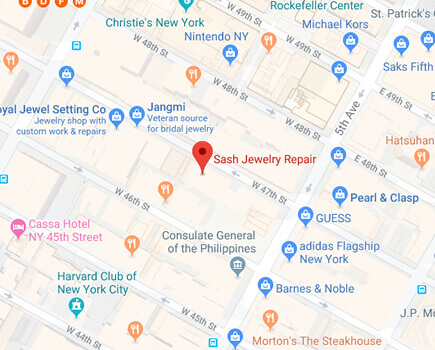 If you are in need of an excellent jewelry repair service, call Sash Jewelry Repair in Manhattan, NY. We supply and also provide center diamond for engagement ring.